← What does Father Really Want for Father’s Day? It’s the element of fun and play that has characterized Alvin’s cooking since he first decided to become a chef over 15 years ago. To this day, Alvin embraces a sense of play and humour as his philosophy to face life’s challenges. As for the “yelling”, it’s all part of what’s made him a top chef. He adds that there is a lot of yelling at hockey games and construction sites as well! Alvin has just finished another successful season of MasterChef Canada, where he joined Michael Bonacini and in judging twelve home cooks for the top prize of $100,000 and the life-changing title, MasterChef Canada. Born in Britain, Alvin moved to Hong Kong with his parents as an infant, and then in the 1960s, the family emigrated to Canada where his father was attending the University of Toronto. Alvin quickly began to absorb Toronto’s culture, and became a life-long Toronto Maple Leaf fan. After all, he says, he saw the last game when the Maple Leafs won the Stanley Cup in 1967. He even suggests that perhaps that is the reason he dyes his hair blue! Cooking came naturally to him, and with a personality that’s not afraid of making mistakes, he set out to learn the industry. In 2003, the self-taught chef had taken over a struggling restaurant in Hong Kong called Bo Innovation, which had been run by a friend of his. His creative dishes soon began to catch the attention of food lovers and critics alike. He began referring to his fusion dishes as “X-treme Chinese.” By 2009, Bo had been awarded two Michelin Stars, a huge triumph for Leung. One challenge Alvin faced a few years ago was a diagnosis of Type 2 Diabetes. He manages his diabetes with exercise, and watching his blood sugar levels. “It’s not the end of the world,” he says, “and that’s how others need to think about it.” He then reminds us of the high percentage of people who have Diabetes, a condition expected to expand over the next decade because of the aging population. 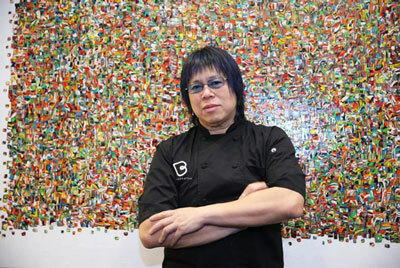 Today, Chef Alvin Leung refers to himself as a true “Scarborough boy” and proud of it, even though he’s quite the world traveller these days. He currently lives in Hong Kong but with a thriving restaurant in Toronto and his successful show on CTV, he frequents Toronto and has a residence here. He and his wife Abby have a daughter, who works as an architect. He also has TV appearances and operates restaurants on two other continents (Singapore, Shanghai, Hong Kong, UK). Five years ago, Alvin joined the judging panel of MasterChef Canada. When the first-ever season was over and done with, the winner Eric Chong joined forces with Alvin Leung and they opened R&D, a modern Canadian-Asian restaurant in the heart of Chinatown. “R&D” aptly stands for “rebel and demon”! 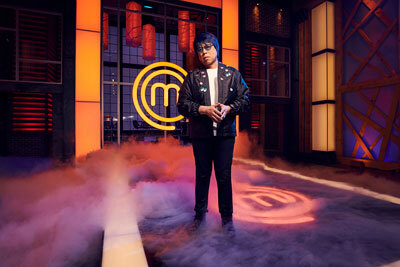 Season 5 of MasterChef Canada returned this April to CTV, and airs Tuesdays at 9 p.m. ET on CTV.